New kinds of material require improved non-destructive testing techniques. Two of them are non-linear scanning laser vibrometry and non-linear air-coupled ultrasound. Both methods use the non-linear behaviour of defects for defect-selective imaging. Damping does not only broaden a resonance, but it is also a highly non-linear process because it is amplitude dependent. In addition, the out-of-plane movement of loose interfaces behaves non-linearly and results in "clapping". Therefore, the excitation of a sample by injection of a sinusoidal wave (using external or internal sources) generates higher harmonics at the damaged area. By using these harmonics, defect-selective imaging is performed where only the defect itself appears. In the case of non-linear scanning laser vibrometry, the entire local mechanical spectrum is monitored at each point by a vibrometer that scans the surface. In the case of non-linear air-coupled ultrasound, the sample is excited at frequencies that have 450 kHz as an overtone. When a narrow band receiver tuned to 450 kHz scans across the sample, it responds selectively to this higher harmonic. Our paper presents results of non-linear imaging performed on carbon fibre-reinforced plastics, fibre-reinforced ceramics (e.g. C/C-SiC), metals, and adaptive structures in order to reveal delaminations, impacts, and cracks. Non-linear behaviour is a general property of most defects. As an example, the out-of- plane movement of loose interfaces behaves non-linearly and results in clapping. The higher harmonics can be generated by injecting a sinusoidal wave into the damaged sample. As the higher harmonics only appear at the damaged area they may be used for defect selective imaging based on non-linear scanning laser vibrometry or non-linear air- coupled ultrasound. The potential of these techniques is now demonstrated. Most defects (e.g. cracks or delaminations) have additional boundaries which are caused by local decoupling of material. Thus an elastic wave is reflected by theses boundaries due to the impedance mismatch. This is the base of conventional NDT with ultrasound . However, additional effects occur at a closed disbond or a mechanical wave with a larger amplitude than the gap between the two surfaces. The elasticity is like in bulk material if the boundaries are pressed against each other whereas in the opposite direction (when the delamination or the crack opens) the material appears softer [1, 2]. These effects strongly distort the incident wave (clapping)  so that this behaviour of mechanical rectification is described by a non-linear transfer function that results in the generation of higher harmonics. In figure 1 the frequency spectrum of the harmonics is shown with a non monotonous (sin x)/x decay (known as the transform of a square wave or also as the diffraction of a slit in optics). Fig 1: Left: transfer function, middle: clipped sine, right: resulting frequency spectrum. If the mechanical displacement is along the defect boundaries, they rub against each other so that friction is the dominant process of non-linearity (which is particularly complicated) . The roughness of the surfaces causes a clapping-like behaviour on a micro scale while the energy dissipation due to friction is represented by a non-linear hysteresis . The non-linear curvature of the magnitude is also related to another class of defects which reduce the mechanical integrity of a component though they do not increase the number of boundaries. A reason for local weakening can be thermal load (e.g. in thermo-plastics) or chemical influence (e.g. diffusion of solvents). As a result of hysteresis (phase changes due to the area of the hysteretic loop are not considered) Figure 2 displays a simplified non-linear transfer function (left) resulting in the deformation of a sine wave (middle). The overtone spectrum contains only odd harmonics (due to the symmetry of distortion) whose magnitude decreases steadily. Fig 2: Left: non-linear hysteretic transfer function, middle: distorted sine, right: resulting spectrum. To detect the non-linear effects described above we first used a scanning laser vibrometer. With this tool it is possible to measure the displacement and velocity of surfaces and, consequently, the properties of elastic waves. As an example to show non-linear effects we scanned Smart Structures. In addition to CFRP materials and honeycomb structures, Smart Structures will also be used in future aircraft construction . These structures consist of CFRP or GFRP materials into which piezo ceramic actuators are embedded. The integration of the actuator into a composite structure is a delicate procedure due to the cure process of the resin matrix. High pressure and elevated temperature are required so that the piezo ceramic element could fracture. In this case only those parts of the broken ceramic can be activated which are still connected to the power supply. Another kind of a defect is a resin agglomeration where the mechanical strength is reduced. Due to irregularities of the process incomplete cure inside the material is possible. All these kinds of defects could be the reason for non-linear behaviour. For the evaluation of the embedding quality we produced an epoxy-glass resin Smart Structure whose actuator is coated with thermoplastic material (figure 3, right). The strength of this coat is adjustable via an integrated heating filament. 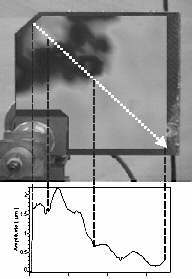 In the example shown below the actuator has various cracks, so that only the lower parts are active (figure 3. left, dark zone). 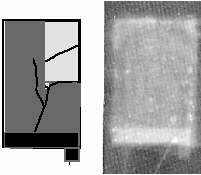 Fig 3: Integrated piezoelectric ceramic with a crack; left: outline, right: optical image. If the structure is heated up it is expected that the thermoplastic material allows for more relative motion of the boundaries and hence stronger overtones. Additionally, as the mechanisms of local non-linearity are different, the resulting overtone spectra differ as well for areas with and without cracks. Fig 4: Spectrum of heated sample at (left) and near (right) crack . While we see the superposition of both kinds of overtone spectra (clapping and hysteresis, see figures. 1 and 2) up to the 7th harmonic near the crack (right), we find only the second and third harmonics (40 kHz and 60 kHz, respectively) in the surrounding material (left) since the overtone contribution from the crack disappears due to the high acoustical damping of the material. Figure 5 shows the amplitude distribution of the second harmonic in the area of the actuator  at various heat currents (or temperatures). The excitation was performed at 20 kHz and 16 Vrms. As expected the non-linear behaviour increases with higher temperature in the area of the cracked ceramic actuator. Fig 6: Spectrum on closed crack in a ceramic plate. Non-destructive evaluation of ceramics is very important because this extremely brittle material breaks abruptly in case of overload or damage. Even a closed crack in a ceramic plate causes higher harmonics that allow to spot this defect. In figure 6 the non-linear behaviour is visualized. The sample was exited mechanically at 1 kHz (sine). Fibre reinforced ceramics are a new material in aerospace and other high temperature applications in general, as it withstands temperatures exceeding 1600 °C. It is made of pyrolized CFRP with infiltrated silicon. This forms a material consisting of 65 % carbon and 35 % silicon carbide. Some applications require complex structures that can only be produced in separated parts which are bonded during the silicon infiltration process by the silicon itself. Unfortunately, large gaps cannot be filled by the silicon sufficiently, so delaminations occur. These weak structural parts have to be detected to avoid a critical failure of the whole component. Figure 7 shows the amplitude of the 4th harmonic (80 kHz) when a 8 mm thickness C/C- SiC sample delaminated at the left side was excited with 200 W power at 20 kHz. The delamination is clearly revealed by the non-linear behaviour even to the edge of the sample due to its nearly closed interfaces. Fig 7: Delaminated C-C/SiC-Sample, 4th harmonic (80 kHz). Fig 8: Delaminated C-C/SiC-sample, profile of the 2nd harmonic (40 kHz) along dashed line. In many cases these interfaces do not have contact with each other over the whole area, and so only a part of them generates higher harmonics due to boundary interaction. An example is imaged in figure 8. Though the whole upper left corner of this multilayer ceramic (thickness 4 cm) is delaminated, the tip of the corner does not show any higher harmonics. The excitation amplitude is too small to bring the surfaces into contact, so they vibrate linearly. This effect can be used to determine the distance between the material in the transition between the linear and non-linear region. The excitation amplitude profile (figure 8, bottom) shows an amplitude of about 1.6 ľm (at 500 W). Changing the amplitude of excitation would shift this edge between the linear and non-linear behaviour and allow to determine the gap distance over a large area. The driving frequency of the built-in actuator does not need to fit to the narrow frequency range (centred at 450 kHz) of the ultrasound detector (experimental set-up see figure 9). However, if the material is non-linear, the higher harmonic of a low-frequency excitation may coincide with the detector frequency. This is the basic idea for non-linear air-coupled imaging of Smart Structures . Thus defects with non-linear behaviour can be visualized when a probe with such defects is driven at 225 kHz (450 kHz is the 2nd harmonic) while these defects cannot be seen when the sample is driven at e. g. 320 kHz (figure 10). This confirms the defect-selective character of non-linearity . Fig 9: Experimental set-up: Non-linear air-coupled ultrasound. We applied this technique to detect areas of impact damage in CFRP. A piezo actuator was bonded to the sample. It is not a real non-contact method; nonetheless, the ultrasound signals are received through air and not through water. The C-scan (transmission mode) displays locations of the impacts and of the actuator (figure 10a). By using the 2nd harmonic for imaging, the impacts can be seen (figure 10b). The impact directly on top of the actuator cannot be detected clearly because of the higher harmonics of the actuator. 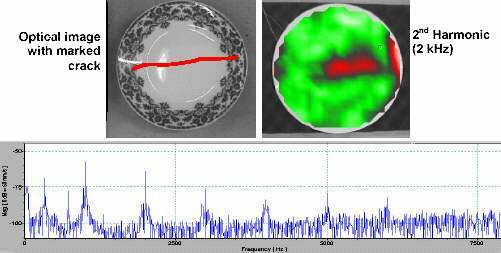 When the plate is excited at 320 kHz, only noise is detected (figure 10c). Fig 10: C-scan of a) CFRP sample with impact damages (transmission mode); b) scan (2nd harmonic); c) scan with an excitation frequency of 320 kHz. If a Smart Structure with a significant delamination between the ceramic actuator and the GFRP material is exited at the same three frequencies as in figure 10 and scanned at 450 kHz the delamination displays a non-linear behaviour so that the second harmonic can be detected, while at 320 kHz no harmonic could be found (figure 11). Fig 11: a) Optical image; b) ultrasound C-scan (transmission mode); c) 2nd harmonic image; d) scan at 320 kHz excitation frequency. As shown in figure 12 no harmonic at all could be observed by scanning a probe with no defect. Fig 12: Reference inspection of a defect free Smart Structure; a) Optical image; b) C-scan (transmission mode); c) 2nd harmonic image; d) scan with excitation frequency of 320 kHz. Defect selective imaging is important for non-destructive imaging since it responds only to defects while all intact structures are suppressed. This makes defect identification faster and more reliable. The techniques presented here are applicable to various kinds of materials used in safety-relevant applications. While the detection methods are remote, input coupling of high power elastic waves or vibrations still require mechanical contact with the inspected component. The authors are grateful to the Deutsche Forschungsgemeinschaft (collaborative research centre SFB 409) and the state of Baden-Wuerttemberg for supporting this work. Also the efficient collaboration with Polytec GmbH is appreciated. R. Barrett, Aerospace Smart Structures the Coming Revolution, paper presented at the 34th Aerospace Sciences Meeting and Exhibit, Reno, (1996).